Where residents pay more in taxes in Northern Va.
Property taxes and other local taxes vary widely and in one locality, homeowners can pay double the property taxes than another Northern Virginia community. And check out our interactive map of area tax rates. WASHINGTON — Where you live in Virginia could make a big difference in how much you are spending on local taxes. The Weldon Cooper Center at the University of Virginia analyzed local tax rates across the state and compiled the tax figures to help taxpayers understand how different localities are using their hard-earned money. The biggest tax most residents pay is the real estate property tax, which is how most cities and counties generate the bulk of their revenue. Manassas Park residents pay the highest real estate tax rate in the state at $1.55 per $100 of assessed value. In comparison, property owners in Fredericksburg pay half that rate — $0.77 for every $100 worth of assessed value. The median real estate property tax rate for Virginia cities is $1.07 per $100 of assessed value. Among local counties, Loudoun County residents are paying the highest rate, though it is competitive with its neighboring large counties. 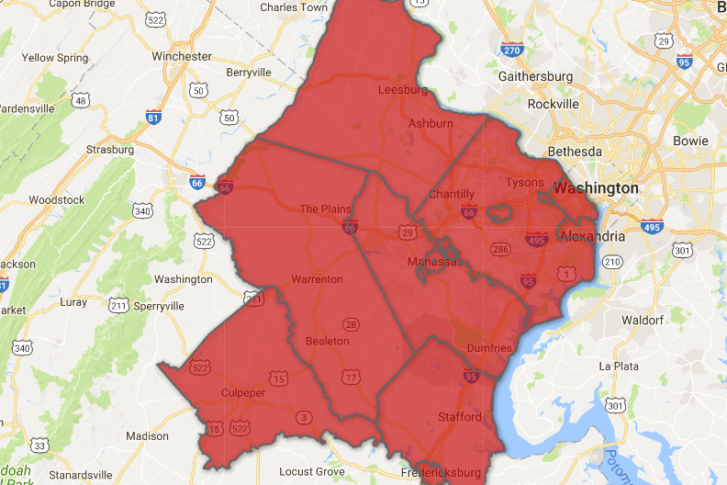 Loudoun residents pay a rate of $1.145, while Fairfax County residents are taxed at a rate of $1.13 and Prince William residents pay at $1.122. Among counties, Spotsylvania County has the lowest rate at $0.86. All Northern Virginia localities have a higher property tax rate than the statewide median, which is 66 cents for every $100 of a property’s assessed value. Personal property tax rates also vary greatly in the region. The personal property tax is collected on cars, recreational vehicles, boats and motorcycles. The Cooper Center analyzed the declared tax rate, processed it through assessment and value ratios that vary from county to county to determine an adjusted effective personal property tax rate. Based on that analysis, Alexandria and Falls Church have the highest adjusted effective personal property tax rates among Northern Virginia cities and are tied with Greenville for the highest in the state at $4.35 per $100 assessed value. The median rate for Virginia cities is $3.12 per $100 and $2.93 among counties. The lowest tax rates are Stafford County at $2.60 and Manassas at $2.83. Manassas Park and Fredericksburg were also below the median city rate at $3.05 and $3.06, respectively. All other cities and counties are above the statewide median. Your local counties and cities also tax you when you go out to eat, sleep at a hotel, or buy a pack of cigarettes. Every Northern Virginia city and county levies a transient occupancy tax — better known as a hotel and motel tax. The highest flat rate in our region is in Prince William County and Falls Church, which each have 7 percent taxes on lodging. Alexandria charges hotel occupants a tax of 6.5 percent plus $1 per night. Fredericksburg and Fairfax County each have 6 percent hotel taxes. Locally, the lowest hotel tax is 4 percent in Fairfax City and Manassas Park. But those who travel beyond the suburbs to Fauquier, Culpeper and Frederick counties will pay even less to stay overnight — each levies a 2 percent hotel tax. For those who dine out, all cities in Northern Virginia and some counties collect a meals tax. Each local city — except for Fredericksburg — assesses a 4 percent meals tax. The tax in Fredericksburg is 6 percent. Arlington, Spotsylvania and Stafford counties also each levy a 4 percent meals tax. Fairfax, Loudoun and Prince William counties do not have a local meals tax. Want to buy a pack of cigarettes? It’ll cost you a bit more in Virginia’s cities — each assesses a tax on cigarettes along with several counties. Alexandria has the highest cigarette tax in the state at $1.15 per pack. Cigarette taxes in Manassas and Manassas Park start at 65 cents and in Falls Church the tax starts at 75 cents. Fredericksburg has a 31-cent per pack cigarette tax. Arlington and Fairfax are the only local counties to levy a cigarette tax. Both start at 30 cents a pack. Alexandria and Fredericksburg even tax fun by collecting admissions taxes at entertainment venues. Fredericksburg has a 6 percent tax for any business or event that collects revenue to enter, whether that is for tickets sold to an event or a cover charge at the door. Alexandria assesses a 10 percent admissions tax with a cap of 50 cents per person.